So we are supposed to have our first hard frost of the season tonight. The blah starts early. Sigh. Winter is just so dull and brown around here. Maybe we will get some snow to give it some character now and then. In the meantime, here is a wildflower image that I shot back in May. 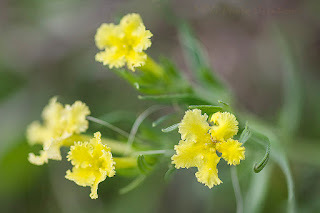 This is a Fringed Puccoon or Frilly Puccoon. It's flowers are fairly small and grow low to the ground.